Besides being a mouthful of a title, All the Footprints You've Ever Left and the Fear Expecting Ahead is one of my favorite Envy records with its capture of the band's raw emotion and the sound of a band becoming more comfortable with themselves. This is a reissue that is a part of Temporary Residence's recent big Envy offering  the label has re-released this record and A Dead Sinking Story as well as issuing Compiled Fragments 1997-2003 for the first time in the U.S. and the U.S. release of Abyssal. This slew of releases makes for a great opportunity to listen to and appreciate a band that is increasingly becoming a favorite of many (including myself). Beginning the album with the atmospheric heavy sounds of "Zero," Envy set up the listener for a wild listening experience by playing with electronic treatments to their instruments to create an instrumental track that in truth is nothing like any previous song by the band. Following the instrumental atmospherics of "Zero" with the excellent "Farewell to Words" works extremely well in establishing contrasting sounds as "Farewell to Words" employs a quick tempo and musical arrangement that gives off a grand or epic feeling even though the song is less than three minutes in length, and the fake out ending is priceless. "Lies, and Release from Silence" captures all of the epic grandeur that the band pursues on later releases in a relatively concise rumination that is just powerful. Envy employs an excellent dynamic range while at the same time giving the impression that they are not wasting any fraction of second with their music by jamming it full of all the best parts of their abilities. The clanging guitar sound evident in "A Cradle of Arguments and Anxiousness" is disturbing (or maybe annoying is a better description) at first, but after it plays for a few measures, it comes off as catchy sounding. The bridge is awesome and so is the vocal arrangement for the whole song. I dig how clear they are at points in the song because it reminds you that he is singing in Japanese. "Mystery and Peace" is another song that seems to be completely infused with an explosive quality (at points there are these snare hits that just sound like a gun going off) that is matched up against movements that sound almost like a lullaby, and it is these little details and flourishes that make the song just sound so good. The persistent piercing guitars in "Invisible Thread" swirl as the tight rhythms tie them together as the vocals just hammer the song into a cohesive blast of noise that does not let up for its under three minute duration. The vocal cadence that is heard in "A Cage it Falls Into" is unique and draws the listener into the song with an almost hypnotic quality. "Your Shoes and the World to Come" closes the album with a song that seems to be full of a definite sense of tension with melodic guitar lines and instrumental passages that play well with emotionally tugging arrangements. The song soars at points with guitars that threaten to sweep listeners up in some epic movement before the band crashes down with the vocals in a singularly cathartic moment. 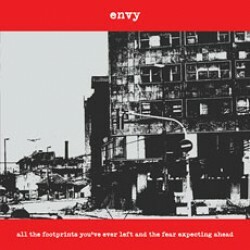 All the Footprints You've Ever Left and the Fear Expecting Ahead contains some of my favorite Envy songs that they have written to date and sits up there in their pantheon of albums. Not taking anything away from any of their other material, my enjoyment of this record just speaks volumes to how good it actually is. The reissue of this album makes this more widely available than it previously was so there can be no excuses. Find this; you will not be sorry as it is an excellent album that deserves to be heard. Posted March 17, 2008, 2:26 p.m.